We are all increasingly feeling the need to help the environment in the face of global warming. Most people would like to "go green," but think that it would be more expensive to change their ways than just carrying on as always. Well, the good news is that you can save money while staying green. You can adopt all kinds of environmentally friendly habits that will keep a sizable portion of your hard earned money firmly in your pocket. Isn't that the best of both worlds? You get to do your bit for the good of mankind, spending less in the process. Of course, you need to know all the best strategies. Some of them are obvious and touted by everyone who preaches the green life. However, there are lots of little known ways to make a huge difference that very few people talk about. It is mainly those kinds of strategies that this magazine concentrates on. Please HELP us save the planet and spread the word out about how easy it is to go green. Send us your story and get involve. 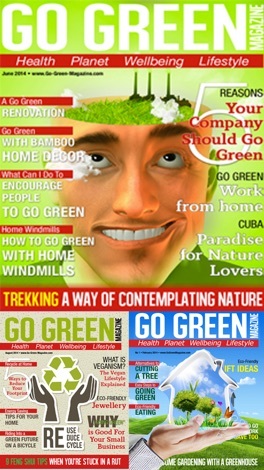 Download Go Green Magazine now!